I have a collection of nonfiction books in my classroom. 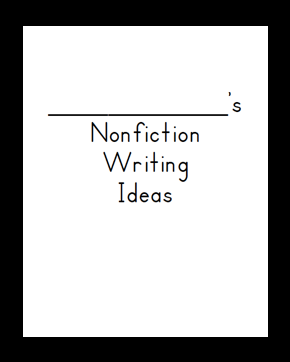 I start my nonfiction writing unit by helping everyone find books about topics they want to become "experts" about. If I do not have what they need in my classroom collection, we head to the library. Sometimes we pair up with older students to help us research and we check out nonfiction books from the library during the weeks of this writing unit. I used Ladybug Teaching Files "printing on post-it notes" to make post-it notes to label interesting fonts, fun facts and labeled pictures in nonfiction books. After we find these features in books, we practice writing them. Find out more about this activity HERE or click on the image below to download. I love the label idea!! I read that post about printing on labels but I never would have thought of using them for nonfiction!! I might try to do it. I just finished the Guess Who books in my class and I have to tell you that by far those books are my favorite nonfiction book for K!!! This is a great way to use labeling and in a really inexpensive way... I love your idea thanks for sharing! I absolutely LOVE this! And our K team was just trying to figure out how where were going to approach the research standard next year. Thanks to you I'm going to go to school looking like a hero this week!! Amazing. Thanks so much for sharing.